James Harris Gallery | Adam Sorensen: "Calderas"
James Harris Gallery is pleased to present Calderas, our fourth solo exhibition of paintings by Portland artist Adam Sorensen. 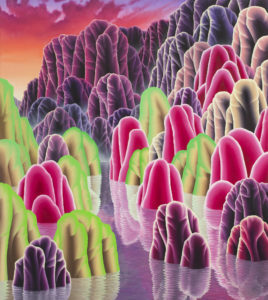 Titled after notorious volcanic edifices surrounding the Pacific Rim, this exhibition represents Sorensen’s stylistic purification by process of painting. The six works on view were completed over twelve months and mark a shift in the artist’s vocabulary. 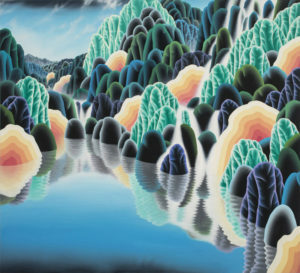 Sorensen’s work affords influence from romantic landscapes, traditional Japanese prints and vibrant video game culture. 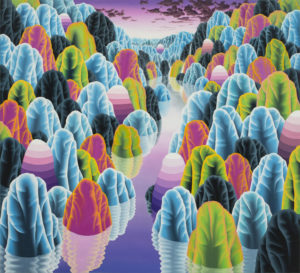 He embraces creation in a reactive sense, combining techniques reminiscent of Japanese masters Hokusai and Hiroshige with graphics of modern Japanese pop culture.Thus slowly constructing contemporary utopian landscapes bathed in psychedelic color. This liminal dialogue between the real and surreal results in a sensory threshold where tradition and influence coalesce. In Calderas, Sorensen has stripped his work of all previous narrative elements. Gone are any reference to flora and fauna. His new fantastical compositions attain a sense of purity. 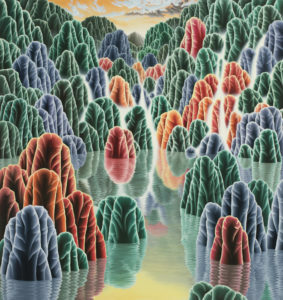 Sorensen’s landscapes evoke the power and beauty found in the hyper realized subject matter of Japanese wood block prints, from the Edo period. This heightened observation is displayed in the palette and pattern of each piece. In the work“Mashu” the layers of dramatic jagged landscape and electric tonesare fitting of a scene preluding volcanic eruption. 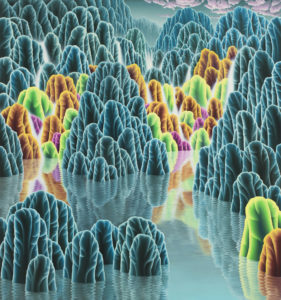 Although imaginary in content, Sorensen’s work metaphorically emphasizesour finite natural resources and how the human imprint has inflicted unnatural stressors on the environment. Romantic painters of the 19th century depicted the grandeur of the landscape to capture beauty and bounty. Sorensenhas chosen the subject of calderas to emphasize rebirth and destruction. Adam Sorensen currently lives and works in Portland, Oregon. Sorensen received his BFA from Alfred University and Post Baccalaureate Certification from Studio Arts Center International in Florence, Italy. The artist has most recently exhibited at the PDX Gallery in Portland. Previous exhibitions have included the Portland Art Museum, Elizabeth Leach Gallery, Oregon Biennial and Volta NY. Adam Sorensen’s paintings have shown nationally; his work is included in the collections of the Boise Art Museum, Seattle University, Portland Art Museum, Progressive Corporation as well as others. Adam Sorensen lives and works in Portland, OR. He had a solo show of his work at the Portland Art Museum in 2011, and shows extensively around Portland and Seattle. The artist has work in the collection of the Boise Art Museum, Seattle University, Portland Art Museum, Progressive Corporation among others. His paintings have been shown nationally.